The ILO adopted the “Work in Fishing Convention, 2007” on June 14 of that year and the articles in the convention have been under consideration by the Thai government since then, the representatives explained. The articles of the convention are expected to become law in Thailand in September this year, they added. Already known is that during the past 11 years copy of the draft law to be introduced has been sent to Office of the Phuket Governor for approval, and returned signed approved to lawmakers in Bangkok. The same process was conducted with 22 of Thailand’s 24 coastal provinces that have major fishing industries. At the handing over of the formal letter of protest yesterday leading representative Itsarapong Srisupawadee said that introducing the articles of the convention as law in Thailand will create problems that will seriously affect the fishing industry, especially in hiring workers. “If the convention does become law, it would change the way of life of Thai fishermen, which would be controlled by foreigners,” he said. “Also, the new regulations would require a lot of money to improve our boats and equipment, which might result in us going out of business – and no longer fishing – because we can’t afford the cost,” he added. “This will lead to many workers left unemployed because the fishing industry would be gone and just waiting to be taken over by foreigners,” he noted. 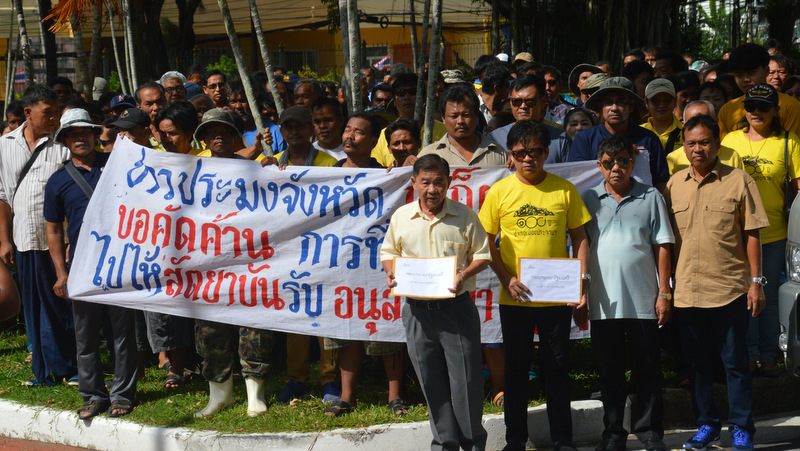 “To this, the Phuket Fishermen Association would like to confirm our position and urge the government not to ratify International Labour Organization Convention 188 into Thai law,” Mr Itsarapong said. Phuket Vice Governor Snith Sriwihok received the formal letter of protest, yet it was not reported what the next course of action would be or which office the letter would be forwarded to. To read the full ‘Work in Fishing Convention, 2007’ as adopted by the ILO, click here. "No irregularities found in Phuket fishing boat checks" ha ha. "Controlled by foreigners ?" Thai Govt is not that stupid. Great example of the complete lack of forethought apparent in the Thai mind. Let them fish themselves out of a living- It will be satisfying to watch the nation descend even further into a complete wreck. Fear not Thai defenders,  there will always be prostitutes to shore up the economy. If Thailand not want to become a international outcast it is not to early, after 11 years 'thinking', to ratify this Convention now. 11 Years were enough to inform/educate the thai fishing fleet operators about the necessity. The Europeans were successful in fishing regulations against will of fishers. But now the fishers are happy. There is still fish to fish. More than in thai waters. limitless Greed with no oversight, the waters are already fished out and soon there will be no forested land left once the greedy developers and corrupt officals are finished stuffing their bank accounts. Bravo! Nice try current fleet bosses! The waters are fished-out and the present system needs immediate change to succeed in the future. If you will not stop the current poor management of fishing resources, then somebody else needs to do it for you.